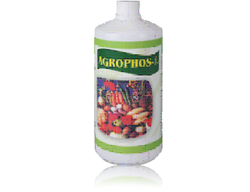 Agrophos-L contains Phosphate solubilising bacteria. How to recover the phosphorous which is available in the soil but fixed ? After a series of trials, Agrophos has been formulated which contains proper blend and proportions of cultures containing phosphate solubilising bacteria. When applied to the soil, it multiplies into tiny organisms around the root zone which steadily release the insoluble phosphate to soluble phosphate. Mix 8-10 kgs of Agrophos in 40 kgs of well decomposed compost (FYM), sprinkle water to moisten it, allow to stand overnight. Apply uniformly over one acre at the time of sowing, irrigate immediately. Can be used as seed treatment: Mix 1 to 2 kg of Agrophos with seeds required for one acre, sprinkle small quantity of water while mixing. Then dry seeds in shade, sow as usual followed by adequate irrigation. Can be used before transplanting: Mix 2 kg of Agrophos in 10 litres of water. Dip the root zone of seeding for 15 minutes and transplant followed by adequate irrigation. Pulses like Soybean, Mung, Tur,Green gram, cow pea etc. 4-5 kgs. Nurseries & Floriculture 200 gms/10 Sq. Ft. CAUTION: Store in cool ventilated shade. Do not mix with bactericide.